Inspired by a friend and the Esoteric Order of Gamers I`ve started organizing my boardgames beyond the standard gamer Plano-like boxes. While the old organizers were inexpensive they didn`t always do the best job of keeping things organized. Often I`d be forced to jam too much in and damage components or have no place to put the many cards that come with the types of boardgames I prefer. Creating custom inserts for Rune Wars. All the player inserts are completed. Neutral, counter and card inserts left to build. It took me a while to decide on which game I would organize first. I wanted something relatively easy which would show a significant improvement in setup speed after organizing that was also likely to be played often. With those criteria in mind I`m really not sure why I chose Rune Wars. Sure, I`ve played it a number of times and will likely get to it again but it can`t really be categorized as something easy nor was setup significantly slowed by the components. What I really wanted to organize was Star Wars but since my collection is spread between two core sets and a number of extra ship models I don`t have an actual box to organize. Star Wars, by the way, is the ultimate example of Fantasy Flight’s predilection for terrible box design. The core set boxes have windows cut in them to show off the models but they don’t have clear plastic to prevent your pieces from falling out if you ditch the insert. I’m in my second week of building these organizers and I’m at the stage where I just want to get them done. On the bright side I did learn a lot of techniques that will make the next game I organize even better. If you are interested in building your own custom inserts I suggest you check out the foamcore section of the Esoteric Order of Gamers website. There are three good tutorial videos that are worth a watch and some pre-made plans for a few games. In the videos it looks easy to make your own but for my Rune Wars insert I’ve ended up with a lot of wasted space. Before you go, however, I have a few tips I’ve picked up based on making custom insert for Rune Wars. I think it’s much better to get used to making inserts with smaller games. Once you start creating removable sections and multiple layers things get very complicated very quickly. At the very least look at the components which will take the most space, figure out how to store them as efficiently as possible and then work around with your remaining space. In the video the presenter mentions how a grid on your cutting board makes it easier to do angles but doesn’t provide more detail. This person has obviously built a lot of inserts and models from foam core so making right angle cuts comes easy for him. In my case I found that my edges quickly fell out of parallel until it was very difficult to get things to fit. Near the end of my first sheet of foamcore I found a way to make right angle cuts accurately and quickly. When I measure for my cut I make sure I hold my ruler flush against the side. This prevents inaccurate measuring caused by not having the ruler perpendicular to the side you are measuring from. I then line the side of my piece against one of the lines of the grid and slide the piece backwards or forwards until my measurement lines up with a gridline. I align my ruler to that gridline making sure that the length of the ruler is on the line and then I make my cut. Once I was able to make consistent 90° angle I found my measurements more accurate and assembly much easier. This is a common measurement error that most people don’t realize they are making. People who follow the adage “measure twice and cut once” but still end up with inaccurate cuts are not aware of how much parallax is throwing off their measurements. Parallax is the difference between two fields of view. If you alternate looking at the world through your right and left eyes the differences between the images are caused by parallax. This can also happen if you aren’t lined up square to your ruler. Since the ruler’s measurements are closer to you than the foamcore you are measuring any slight angle will make your measurement long or short. When you are measuring and cutting it is important to make sure your line of sight is completely perpendicular to the surface you are measuring. This will make sure that your pieces fit snug together without large gaps. I didn’t do this when I was building my Rune Wars insert but I wish I had. When you start it’s a really good idea to setup the game first. Especially if you’ve never played the game, or having played the game in a long time. Seeing which components want to be grouped together makes it much easier to plan how to build the insert. 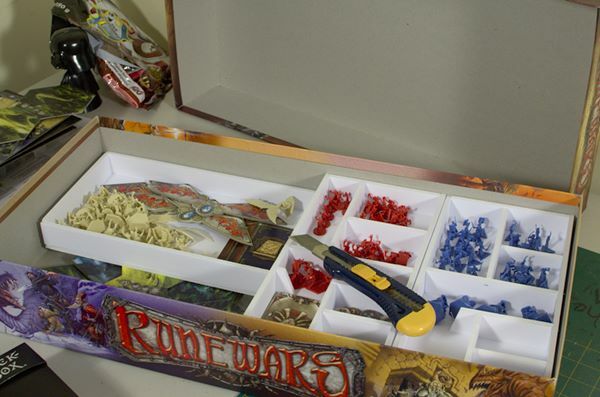 If there is a set of player components it can be a good idea to build removable sections that can be pulled out of the box and handed to the players. If there is a pool of counters build a removable section for the counters. In this case wider, shallower sections will make it quicker to grab the counter you need in a game. Creating custom box inserts is a great way to organize your board game boxes. I hope the videos I’ve linked and my tips inspire people to go out and buy foamcore. I find that anytime there is a significant setup time for a board game my group is less likely to play the game. As a great “ameritrash” game lover anything I can do to reduce setup times makes it more likely that I’ll get to play the games I want to play. Very insightful tips. Thanks for the advice! Thanks. The video really makes it look easy and gives a lot of information. Make sure you give it a watch.